The annual ROM research colloquium reveals local researchers' competitive edge on the study of meteorites. A Leonid meteorite over Toronto, in 2009. The Royal Ontario Museum (ROM) is more than glass angles and that room full of swords. On Friday, the ROM held a free, day-long colloquium, as it does every year, to present a year-in-review of discoveries by the museum’s researchers and curators. These investigative endeavours cover every imaginable field, from natural history to textile art; as a result, the colloquium is the sort of event where a presentation on the cultural significance of Cameroonian porcupine-quill garments can be followed by a lecture on Amazonian fish conservation (and, on Friday, was). But we were there for the meteorites. Meteorites are just about as exciting as it gets for space geeks—being rocks formed outside of our own planet, their very constitution reveals tremendous amounts of information about the solar system. But figuring out the stories behind those space rocks without completely obliterating them first poses a unique challenge. Which is why the ROM’s recent acquisition of a fancy new micro-Raman spectrometer is particularly exciting. “It’s a microscope hooked up to a laser,” Hyde said. “You can stick a whole meteorite in there, focus on an area with the microscope, and you can shoot the laser at a very small area and you can say something about what it’s made of.” One thing scientists would love to discover using this technique is evidence of water having come into contact with a meteorite during its formation—suggesting, ultimately, the possibility of life-sustaining conditions beyond earth. Recently, a Martian meteorite probed by ROM researchers working alongside the Canadian Space Agency revealed just that: water contact. While some analysis eventually proved that the interaction with water had occurred after the rock had landed on earth, there was still something remarkable about the discovery: there was jarosite present in the rock. Jarosite is a mineral that forms only in acidic conditions, so it’s typically found only in mine drainage sites. But this particular rock was found in a desert; the only water it could have interacted with would have been a little rainwater and air humidity, but hardly any of the “nasty stuff that makes jarosite,” according to Hyde. In other words, water from the earth that wasn’t acidic interacted with this meteorite and became acidic, thus forming those minerals. If that could happen on earth, Hyde suggested, why not Mars? Meteorites are an especially hot topic at the moment, given that, last December, a piece of one roughly the size of a basketball landed just north of Peterborough, in Selwyn, Ontario. University of Western Ontario researchers captured the fireball’s landing on camera, and, along with ROM researchers, immediately turned to the public for help locating its fragments. That local researchers now have the technology available to delve into the make-up of these space rocks while preserving their physical integrity is huge. Here’s hoping for evidence of aliens. 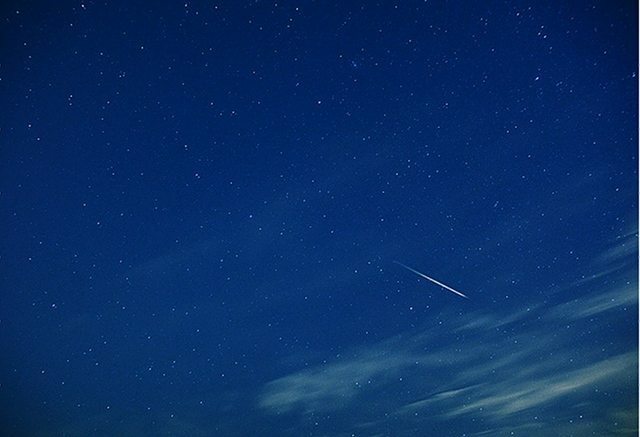 CORRECTION: February 8, 1:45 PM As a reader kindly pointed out to us, the photo originally published with this article (this one) featured a meteorite-resembling, slow-motion airplane that was not, in fact, an actual meteorite. We regret the error.